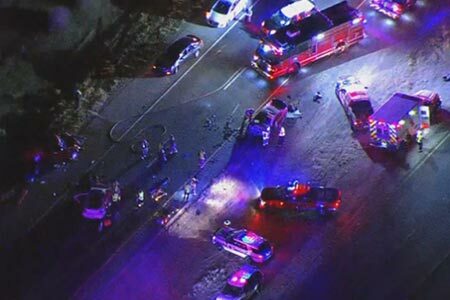 Chandler, Arizona—A head-on collision on SR-347 resulted in the deaths of Julissa Torres, age 26 of Maricopa, and Karen Ankiewcz, age 70 of Sun City West. Six others were injured in the deadly wrong-way accident. According to accident investigators with the Arizona Department of Public Safety, Ms. Ankiewcz was operating a a Hyundai sedan the wrong way on SR-347 when it collided with a Chrysler 300 driven by Julissa Torres. Both drivers died at the scene. Ms. Torres' passengers were his 26-year-old boyfriend and their two young children, Journee, age 4, and Layla, age one. The boyfriend and Journee were transported to Chandler Regional Medical Center, where they will recover from their injuries. Layla was treated at the scene. A third vehicle smashed into the wreckage of the first accident. The driver of that car, a man age 57, and a 13-year-old passenger were transported to a hospital, while a 15-year-old teen was treated and released. According to the DPS investigators, more than a dozen emergency vehicles responded to the scene. We extend our condolences to the families and friends of Ms. Torres and Ms. Ankiewcz for their tragic losses and we wish those who were injured swift and complete recoveries.